The group came from Fremont, New Hampshire and was formed in 1968. The group was formed by Austin Wiggin and originally consisted of three of his daughters: Dorothy "Dot" Wiggin (vocals/lead guitar), Betty Wiggin (vocals/rhythm guitar), and Helen Wiggin (drums). Later the quartet was completed with Rachel Wiggin (bass). Austin’s mother predicted her grand-daughters would become a successful musical group and he saw the commercial opportunity with the coming of the English Invasion. 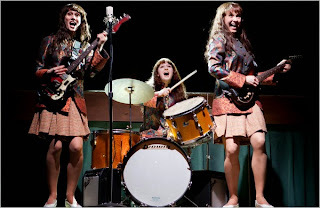 The group was called the Shaggs after the popular shaggy hair style of the period. The group made one studio album in 1969 called Philosophy of the World but this failed to attract much attention. The all girl group were a popular novelty and continued to perform live. Their idiosyncratic compositions were both charming and unsettling. Their instruments were often out of tune and the songs set to heavy drumbeat often had no obvious meter. At best their style was compared to the free jazz compositions of Ornette Coleman and Philosophy of the World soon gained cult status. Both Frank Zappa and Kurt Cobain were fans of the album. The group eventually broke up in 1975 after their father’s death. The album was later released in 1980 and became an avant-garde cult classic. The group reformed briefly in 1999 with Dot, Betty, Rachel. Helen declined to attend and Tom Ardolino played drums.